You might have assumed this article would be about short sales on the market today, but that is not the case. You see, the real estate market is about to experience a surge of homebuyers who took part in short sales as sellers three to five years ago. That's right, there is a wave of buyers who will steadily hit the market now and for the next five years that will push the housing market back up to historically "normal" levels and beyond, making 2014 a good year to finally sell your home. If you caught our recent article on 3 key concerns that could negatively impact the real estate market in 2014, then consider this article the counter argument about why past short sales will be an undeniable force in the Tallahassee real estate market for years to come. I have been a real estate agent in Tallahassee since 1991, and I will confess to never having heard the term "short sale" until 2006. 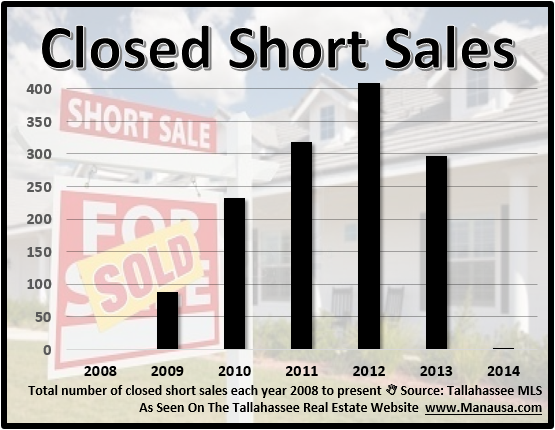 That means I was a real estate professional in Tallahassee for 15 years and never used the term short sale. Why? Because even when my company was selling more than 800 homes per year, it was a very rare event to help a seller negotiate a home sale with a bank where the funds from closing were not sufficient to cover the loans on the property. But oh how times have changed. Basically, short sales were hardly performed (and never reported) prior to 2009. Beginning in 2009, there has been a relatively large group of people undergoing short sales. People who do short sales used to have good credit and they owned their own home. People who do short sales will want to own a home again. People who do short sales typically have to wait about 4 years before they can get another home loan. Therefore, I believe the average penalty period for short sellers will end up being four to five years. 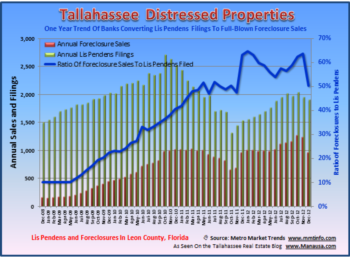 This means that 2009 and 2010 short sellers are buying now and will impact the demand of homes for sale in Tallahassee. What this really means is that until now, the majority of past short sellers could not buy again and the 2014 market will be the first year in which these past owners will be streaming into the Tallahassee real estate market. How significant could this be? There were just over 3,000 home sales recorded in the Tallahassee MLS last year. There are more than 300 past short sellers from 2009 and 2010 that will be eligible to buy homes this year, meaning an increase in the buyer pool of 10% over last year. When you combine this group with the growing demand from other channels, it is hard to argue against a thriving real estate market in Tallahassee. So if you are thinking of selling a home in Tallahassee in 2014, please drop me a note and we will schedule a time to evaluate your home and let you know what you can expect to gain from a sale. Is there any update on the extension of the Mortgage Debt Forgiveness Act? If taxes is are to be paid on this huge loses, what else will be the incentive of doing short sale instead of just waiting foreclosure? Regardless of the tax consequence, a short sale will impact your credit ranking far less than will a foreclosure or deed in lieu of foreclosure. Also, you will likely sell the home for more money through a short sale and thus have a smaller deficiency. On the extension .... the current prospect of any bills being enacted in the short term is not particularly high. We are facing four big hurdles. 1. The Chairmen of both of Congress’s tax committees (Senate Finance and House Ways and Means) have committed to passing comprehensive tax reform legislation before the end of 2014. As part of reform, they have both indicated that they plan to go through the long list of expiring items, including mortgage debt cancellation, and cull those that are not worthy of permanence and make all the “worthy” ones a permanent part of the tax law. However, tax reform is unlikely to be completed in the coming months. If Congress were to extend the expiring provisions now, it might appear that they were giving up on tax reform. This is not a signal they wish to send. 2. There are over 50 such expiring tax provisions (often referred to as “extenders”). Congress rarely passes single tax provisions by themselves. The rules in both the House (and especially the Senate) could allow for added amendments that would turn a simple bill with wide support into a politically divisive bill. 3. The extension of the tax relief “costs” money to the Treasury. The Joint Committee on Taxation estimates that a one-year extension of the mortgage debt cancellation relief would cost $3.7 billion. Some Members of Congress will insist that amount be offset by raising taxes elsewhere or cuts in spending – an ongoing debate in Congress. 4. The Chairman of the Senate Finance Committee, Senator Max Baucus of Montana, has been nominated by President Obama to serve as the next United States Ambassador to China. His departure from the Senate will turn the chairmanship over to Senator Ron Wyden of Oregon. As with any change in committee leadership, there will be an adjustment period. In sum, we (REALTORS) have tried to have the extension passed by year-end but it was not possible. Our lobbyists are in daily meetings with Members of Congress, pressing for an extension and providing the most up to date data on short sales and foreclosures to continue to highlight this as a top priority. What can you do? First, you can contact your Representative and Senators to urge them to act on the bills that exist to extend the Act. The more the politicians hear from constituents, the better.